Ready for a Mediterranean flavor explosion? 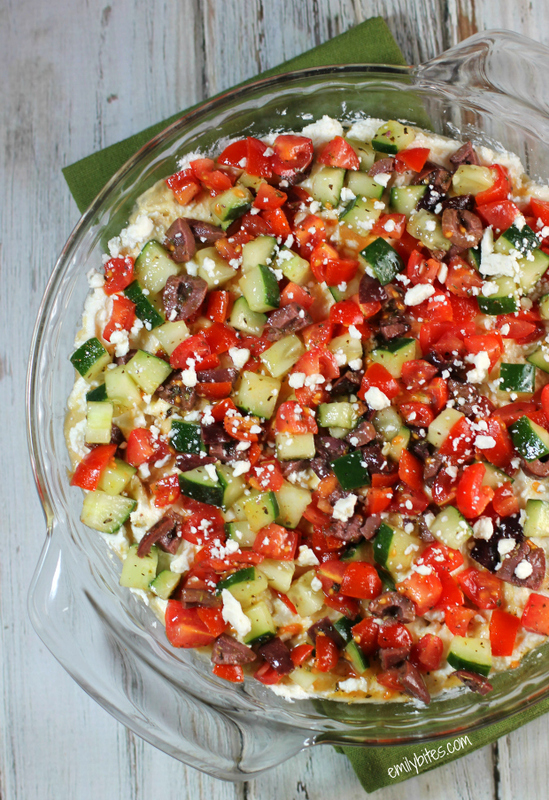 I seriously want to eat this Greek Layer Dip every single day. It’s that good. Plus, it’s served cold, so it’s the perfect dip to make and bring to a potluck, holiday party or tailgating feast. It’s guaranteed to be a crowd pleaser and you get a hearty 1/3 cup serving for just 159 calories or 4 Weight Watchers points! As some of you may already know, I’ve partnered with Sabra this year* to develop recipes as part of their 2014 Tastemakers Panel. I can proudly and honestly say that they make my absolute favorite hummus in some of the best and most creative flavors (they also make yummy guacamole, yogurt dips, salsas and other spreads such as my husband’s all-time favorite bruschetta), so it’s incredibly easy for me to come up with tasty recipes using their products. For this recipe I used Sabra’s classic flavored hummus (chickpea with a bit of garlic and tahini), added a thick and creamy Feta cheese layer, and topped it with diced Mediterranean vegetables lightly tossed in a Greek vinaigrette. In the photos I actually put the hummus layer first, at the bottom of the dish, but in the recipe I recommend you use the Feta layer first since the hummus is easier to spread. 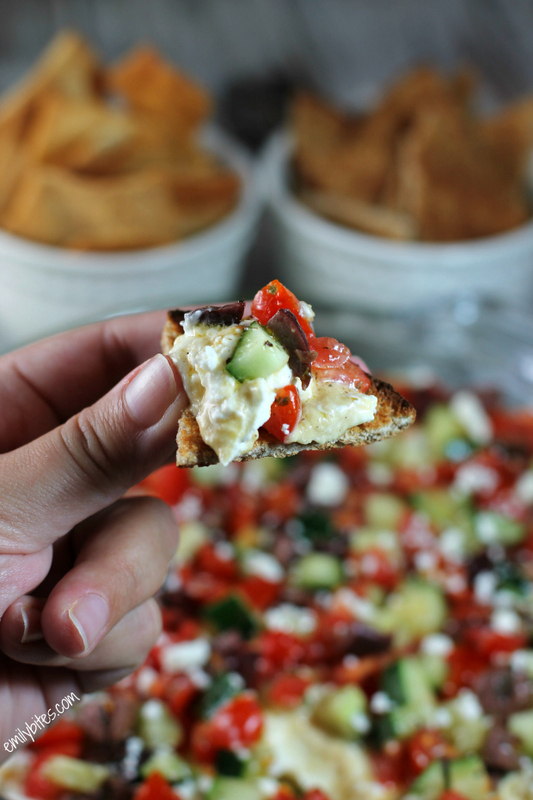 Feel free to serve this recipe with whatever dippers you like (pita chips, veggies, etc). To make my favorite Weight Watchers-friendly dipper, lightly mist the cut side of some sandwich thins with olive oil cooking spray and then sprinkle lightly with salt. Place the sandwich thin halves in the toaster oven and toast to your desired doneness. When finished, cut each sandwich thin half into 6 triangles. Each sandwich thin should give you 12 triangles. In a medium bowl, combine the oil, vinegar, garlic powder, onion powder, dried basil, oregano, mustard, salt and pepper and stir until well combined. Add the diced cucumbers, tomatoes and olives to the oil mixture and stir until well combined. Spread the tomato/cucumber mixture over the top of the hummus in the pie plate and serve. Thank you, I hope your very Greek family approves! I agree, it’s hard to go wrong with these ingredients. Let me know how it works out! I just want you to know how easy you make sticking to Weight Watchers. I can’t wait to try this dip, looks relish. I love this blog. LOVE! Thank you for your hard work!! This looks really delicious, but I really don’t like chickpea hummus. Is there something else I can substitute for it? Thanks! A flavor explosion indeed! This would be a HIT at any party! Thanks Mary! I don’t personally calculate the sodium at this point, but myfitnesspal has an awesome recipe calculator where you can enter in the ingredients and calculate the nutrition information you’re looking for! This looks delicious! 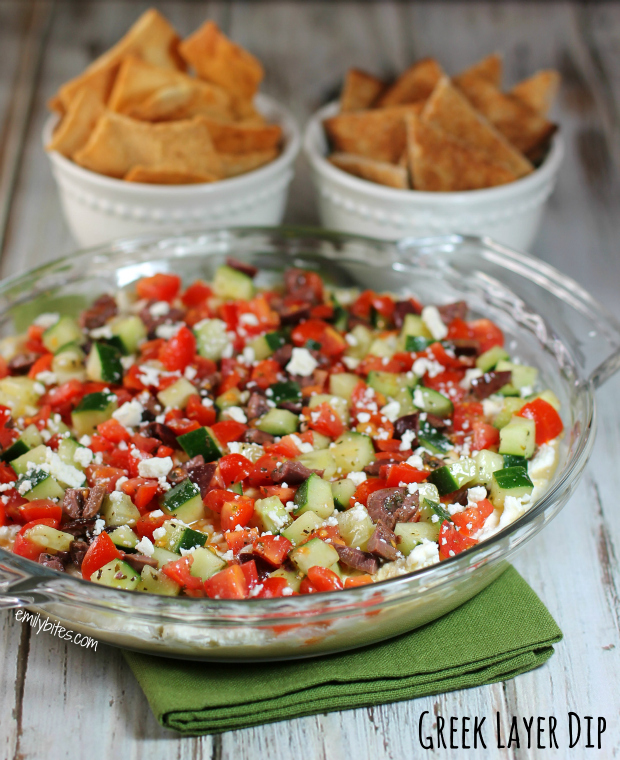 This dip would also make a wonderful spread for sandwich wraps along with a little gyro meat. Mmmmm! It’s too bad that you don’t credit other authors for this recipe. This is not an original recipe although you’ve made some tweaks. Hi Meredith, I’m sorry you would think that. I am diligent about crediting the sources I use, which you’ll see if you flip through my other posts. I brainstormed this recipe on my own or I certainly would have said otherwise (not trying to hide anything, adapting recipes from elsewhere is great!). If other people or bloggers have had similar ideas then it just a case of great minds thinking alike. These would be great for a party dip! I think I would make a whole meal out of this! Wrap it up in a tasty pita and lunch is served! YUM! I am recently (this year) obsessed with Sabra. I’d pretty much want to eat this every single day for lunch. I love, love, love Sabra hummus! silly question – dried mustard seasoning or yellow mustard like you put on hot dogs? I love everything about this! there’s a Greek restaurant here that makes Greek nachos (top with gyro meat and call it dinner) but I haven’t made anything like it at home before. This is totally inspiring me to! What a fantastic way to doctor up hummus! I made this twice last weekend. Sent it to a college football tailgate party and on a girl’s wine-tasting weekend. A big hit in both places. I know you mentioned, above, that you used mustard in a jar – but do you use yellow mustard, Dijon, Spicy Brown?? I can’t wait to make this and I love the other viewers suggestions of piling this in a wrap with some Gyro meat. OMG!! Looks delicious! Do you think this could be made a day or two ahead for a party? Thanks! I wouldn’t put the whole thing together a couple days before, but you could prep most of it ahead. You can dice up the tomatoes, olives and cucumbers early and also make the feta layer mixture ahead of time. Then on the day of the party you can just spread the cheese layer and hummus layer in the dish, mix the dressing real quick and toss the diced veggies in it and sprinkle over the top. I’ve done that before and it makes it really simple day of – hope that helps! Huge hit with my family. Just tried this recipe for the first time yesterday. It was so easy to make and everyone enjoyed it. Thanks Emily! I was looking for a dip recipe for a party I have coming up, and I thought of this. I’m so glad I did! I’m sure my friends will love it just as much as my family did!